This afternoon, it was Barn Owls! We had 6 of them in a fairly small enclosure. The big owl flight cage is occupied by Great Horned Owls – lots of them, and if we put the barn owls in there with the great horns, the barn owls would be killed and eaten. Sadly, the boss had previously decided to waste a LOT of grant money on a display building, even though we are not operating a zoo, and all the display building does is keep some of our tamest non-releasable animals isolated from people. Hardly any of our visitors to the wildlife center go over to that building, especially since it is mostly fenced off. The money for that building could have been used to provide much better care for the animals, but my boss does dumb things… that’s an understatement. And no, I’m not worried about getting fired – not only because no one I know out here is aware of this blog, but also because I’m a volunteer. 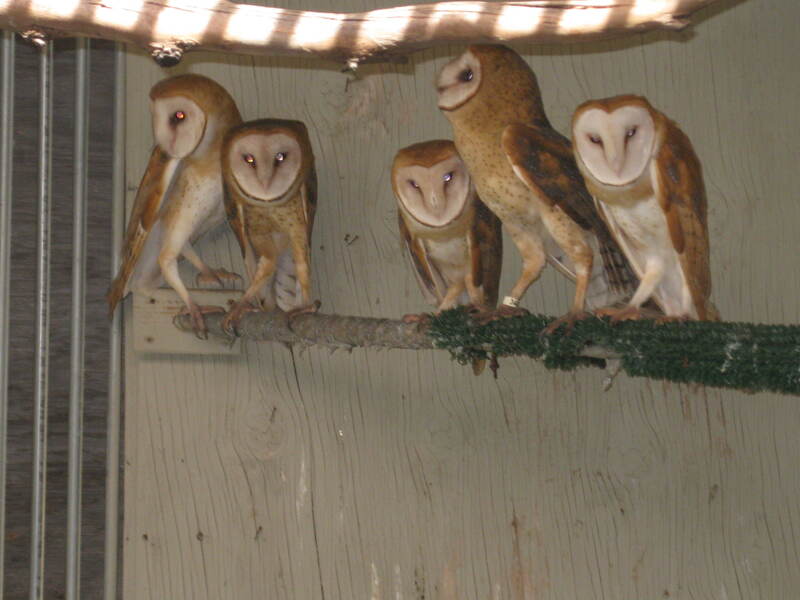 So anyway.. yesterday I got a call from one of the raptor guys asking if I could release 4 barn owls. I called back and said yes! I don’t work with raptors much anymore. I spent from October of ’06 to May of ’07 doing that, and then from July ’09 to February ’10 doing that, and got tired of being attacked. I left the center for two months, and returned in May. At that time, I started working with songbirds, which is what I mainly still do. The only raptor wrangling I did since May was netting and grabbing a few hawks and putting them in boxes for transportation to hack boxes. Hack boxes are huge crates that were originally used for peaches. These boxes are put on stands with one side pulled down flat, like a door hanging down. The hawks or owls are placed in these boxes with free access to the outside world via the lowered door. It is young birds that are brought to these boxes, birds we are not sure can hunt on their own, so dead mice are placed each day or evening on the lowered door, in case the birds have not yet been hunting successfully. They fly around and come back to the hack boxes to eat, until they don’t. A few days’ worth of dead mice laying on the door means the hawks or owls are hunting completely on their own and will not be returning. Today though, the birds I helped catch were not going to hack boxes, they were determined to be old enough to be set free. There were 6 barn owls in this small enclosure. My fearless supervisor went in without any safety gear and netted and grabbed several. I assisted. I wore jeans, long sleeve shirt, thick goggle-type sunglasses, a knit cap, and a wide-brimmed hat over it. I don’t take chances. My supervisor has been working at the center for at least 23 years, and doesn’t get fazed by much. We have a mesh covering over the hallway that runs in between cages. This is because sometimes birds we are trying to move from enclosure to box get loose. I was trying to put one owl in a box that already contained an owl, and of course the first one got loose! I grabbed the little net, and finally chased it down. I had to be very careful in grabbing it, because my supervisor was wearing the gloves I brought out. She didn’t bring out any. I had to use my bare hands, but didn’t get taloned, which is nice. While I was chasing the escapee, my supervisor put the other owls in the boxes. I then walked to my car with 3 boxes, got the boxes situated on the car seats, and belted them in. Then, I headed out. We are kind of supposed to release animals close by to where they were found, if possible. I don’t know if this is a serious rule, or not something to be taken to seriously. It’s hard to tell. I was told to release the first three owls at the same location. We have tons of orchards and fields where I live, so three more owls added to the barn owl population will not be a problem where I released these particular ones. The 4th owl was supposed to be released right in town. I didn’t like that idea – too much attention. It is illegal to transport native wildlife without a permit. The only permit I was given was out of date, and not in the car I was using. I decided to release the 4th owl outside a large rural cemetery, which is located amidst farmland, and along a river. I brought the owl into a grove of large trees, and opened the box. Like the other owls, this one flew right out. However, it didn’t fly into the trees right away, it flew toward the cemetery, perched on a building for a few seconds, thought better of its idea, and flew back toward me, which was wonderful, because I had my video camera on it. I stupidly hadn’t had the camera when I released the first two, and the thrid one flew away SOO fast into the orchard. I was VERY glad the 4th owl flew in the wrong direction, then back my way, and into the trees. That was lovely. It was wonderful (though at times scary) to be raptor wrangling again.